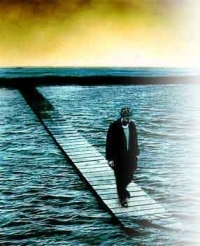 Many people are motivated to look for answers to the big questions of life when they hit a patch of depression, and many who enter a path of finding answers hit spells of gloom and feeling inadequate. Depression is on the feminine/feeling side of the mind. Emotionally we're convinced that something we dearly want is unattainable. Intellectually we may see that it's not necessarily so, but the feelings of personal inadequacy and hopelessness dominate. The solution lies in reaching the dispassionate point of observation where we're no longer lost in the morass of negative (and positive) emotions. How do we go about climbing out of the pit of depression? I languished in it for nearly seven years, and it was a tremendously valuable time for getting to know the mechanics of the mind, so it may be more productive than we give it credit for. But I suspect I could have gotten the life-lesson in a shorter period. Depression is the reaction that sets in after our I-amness has received a deflating blow. It lasts as long as it takes us to get over the feeling of inadequacy that follows having our emotional socks knocked off . We've been knocked down, and it remains to be seen how long it will take us to stand back up and risk the next knock. The internal caucus votes, the pride vs. fear tally is taken, and we see whether the belief of personal inadequacy still holds or has been overridden. Life is an attack on pride  on misplaced self-esteem. Depression is a spa for wounded pride. If our pride has hit bottom, we admit to ourselves that we need help and may find ourselves sincerely asking for help from something bigger than the little person we believe ourselves to be. But to get back to the question of how we can minimize the time it takes us to learn the lesson that depression is trying to teach us, there's a fascinating story of a man named Mike May in Robert Kurson's Crashing Through: A True Story of Risk, Adventure and the Man who Dared to See. Mike was born in 1954. At age 3 a chemical explosion destroyed his sight. One eye was replaced with an artificial eye, and the cornea of the other eye was destroyed so that it could no longer prevent cataract development. A leading eye surgeon at the time tried corneal transplants, but Mike's eye rejected them. He didn't let his blindness get him down, however. 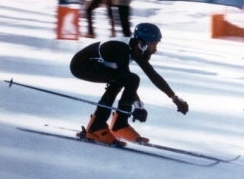 As an example, he started snow skiing as a young man but not by holding onto the ski pole of a sighted person skiing in front of him as was the technique at the time. Mike wanted to go fast, so he had a sighted friend ski ahead of him and guide him by yelling instructions. He and his buddy snuck into the 1984 Olympics in Sarajevo and set a new speed skiing record for the totally blind (65 mph! see photo). 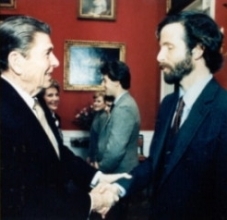 President Reagan honored him along with the U.S. Winter Olympic team at the White House. When he was 45, Mike met a surgeon who examined his remaining eye and told him that he was a good candidate for a highly risky experimental procedure in corneal transplanting. After extensive consideration, Mike had the surgery, and it was successful. His eye and optic nerve functioned extremely well, giving him excellent color and motion detection. Facial recognition, depth perception, and object recognition were poor, however, and didn't improve in subsequent months. Mike became increasingly discouraged. An fMRI scan eventually showed that the areas of his brain associated with the second, more complex, set of functions weren't being activated. The researchers concluded that those neurons were no longer available for learning. Seeing under those circumstances was a horrendously tiring effort, making his life with sight more difficult than it had been before his sight was restored. The researchers reluctantly concluded that there was nothing that could be done for Mike's brain to to improve its functioning with respect to those complex functions of seeings. Mike let their prognosis sink in. But then an amazing thing occurred. He shook off their conclusion and asked himself: "What if I try to see by being blind again?" and began formulating a plan. He effectively told his vision to back off, to play a subordinate role to the other senses. Over the following weeks he made astounding progress with recognition of what he was seeing when he could investigate the objects with his other senses, which had been highly developed during his decades of blindness. But then he asked himself how he could comprehend things that were out of reach of his other senses. That was a real puzzler to him. Then it dawned on him to ask himself what he was really good at. The answers he came up with didn't really apply ... until he hit on his organizational skills and memory. He began constructing a mental catalog of clues that would help him recognize thousands of common objects without having to think about what they were, and the prodigious memory he had developed over the years began substituting for the nonfunctioning parts of his brain. By asking himself relevant questions that he didn't know the answers to, Mike effectively challenged the parts of his internal dialogue that were arguing for hopelessness and self-pity. Note 1: The phrase ["knock your socks off"] first appeared in the mid-19th century meaning "to beat or vanquish someone thoroughly," at first used literally to mean to win in a knock-down fistfight so savage that the loser might expect not to only lose his shoes in the fracas but his socks as well. The number of brawlers who actually lost their socks was probably pretty small, but a threat "to knock your socks off" was one of a number of such hyperbolic pugilistic phrases popular at the time, including "knock your lights out" and "knock you into next week." ~ From The Word Detective Feb. 18, 2004 issue. For more details on Mike, see his Sendero Group.com/ web site.